On June 5, 2017, the Supreme Court refused to hear the appeal of Marine Lance Corporal Monifa Sterling, thus leaving her court martial and bad-conduct discharge in place. The case attracted attention because Sterling claimed that her religious liberty rights were violated. Sterling had printed a Bible verse on a piece of paper and taped it to her computer. Her sergeant told her to take the verse down. When she did not, the sergeant took it down and threw it away herself. Sterling reprinted it and put it back up. The sergeant again tore it down, and not long after began court martial proceedings against Sterling for failing to obey orders. The paper she posted said, “No weapon formed against me shall prosper”, quoting Isaiah 54:17. Sterling said that many other Marines in the office had personal items on their desks, a claim that is not challenged in any court documents. But only Sterling’s was ordered removed. In the key part of its ruling, the military court ruled that the sergeant was justified in ordering Sterling to take the post down because the quotation could cause religious division: “It is not hard to imagine the divisive impact to good order and discipline that may result when a service member is compelled to work at a government desk festooned with religious quotations, especially if that service member does not share that religion.” It should, perhaps, be noted that Sterling shared the desk with another Marine, and her job involved frequent interactions with other personnel, though there is no record that anyone other than the sergeant complained. But this is, of course, the nature of freedom of speech and freedom of religion: you may occasionally hear or read things you disagree with. Mature people respond by ignoring such statements or responding with their own opinions. Need I point out the logic problem here? If the justification for ordering Sterling to take down the quotes was that they might cause “religious division”, but the sergeant did not know they were religious at the time she gave the order to remove them, then what was the sergeant’s justification? Without the religious element, “no weapon formed against me shall prosper” sounds exactly like the sort of slogan the Marines would use in morale-building exercises. If the sergeant knew that the quotes were from the Bible, than ordering Sterling to take them down because the sergeant didn’t approve of the religious belief brings up clear issues of violation of Sterling’s religious freedom rights. You can’t have it both ways. Either the sergeant knew the signs were a Bible quote or she didn’t. If she didn’t know they were a Bible quote, then the “religious division” argument falls apart, an after-the-fact justification for an incoherent order. If she did know that they were Bible quotes, then she was violating Sterling’s freedom of religion. The court also makes the interesting argument that while the Constitution and the Religious Freedom Restoration Act require that the military respect soldiers’ right to exercise their religion, “the definition of a ‘religious exercise’ requires the practice be part of a system of religious belief … Personal beliefs, grounded solely upon subjective ideas about religious practices, will not suffice because courts need some reference point to assess whether the practice is indeed religious.” They go on to say that printing Bible quotes is not part of “a system of religious belief”. Like, wow. Surely any Christian would tell you that reading Bible verses is a pretty integral part of practicing Christianity. I’ve seen posters with quotes from the Quran and the Baghavad Gita, so apparently the idea of printing quotes from your scripture and posting them on the wall is common to other religions, too. True, the courts have said that you can’t just claim that anything you do is part of your religion and thus protected religious exercise — you can’t get away with snorting cocaine or insider trading just because you say it’s part of your religion. Courts have sometimes had to investigate whether a practice is truly religious or if that’s a sham defense. But responsible courts have treaded very delicately in this area, conscious that it is not the job of a court to decide what is or is not a “valid” religious belief. It is fair to ask, “Is snorting cocaine really part of your religion or did you just make that up when you were arrested?” It is difficult to see how any serious person could really question whether printing Bible verses and taping them to the wall has anything to do with Christianity. The court went out of its way to dismiss Sterling’s religious liberties. This should be a concern to all Americans. Even if you’re not a Christian, the same standards could be applied to your religion. 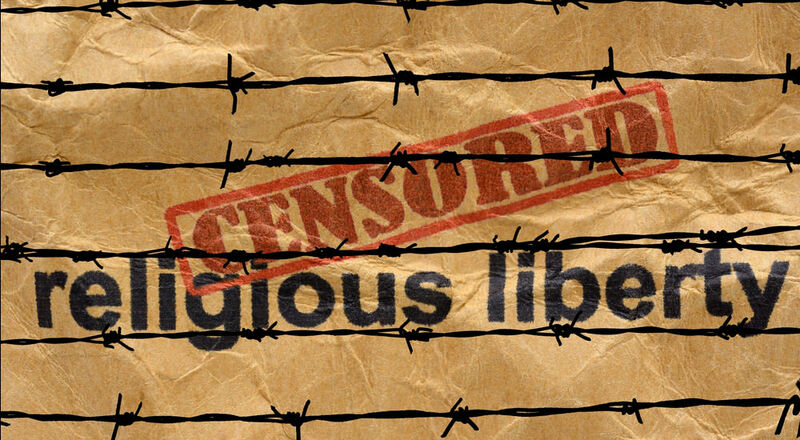 Even if you’re an atheist, the same standards could be applied to your free speech rights.